Superior Fires’ range of Grosvenor High Efficiency Gas Fires ticks all the boxes with stylish adaptable design. Our popular Grosvenor range incorporates a glass front, which optimises heat performance and efficiency while providing a traditional inset installation. The Grosvenor is versatile high efficiency gas fire with several traditional and contemporary designs as well as a choice of colours and finishes, meaning you can create the right fire to suit your interior. Choose from our Grosvenor high efficiency gas fires for a striking feature for your home that can also save you money! Our exclusive Grosvenor Grove range combines practicality with a simple, minimalist design to create an attractive, premium finish. Alternatively, there is the Grosvenor Blenheim range in a choice of finishes from black to chrome, with its classic, authentic design. The glass front of the Grosvenor range of high efficiency gas fires significantly reduce the warm room-air being drawn up the chimney or flue. In addition to this, the convection air design draws in present cold room-air and circulates this through the hotbox to produce convected hot air back into the room. This increases performance of your fire. Our Grosvenor high efficiency gas fire collection has both traditional and modern appearances to make sure you will find a suitable fire for your personal tastes and the style of the existing room. Our Grosvenor range of high efficiency gas fires are designed for most pre-cast flue systems as well as class 1 and class 2 conventional chimneys. Please note this fire fits a standard fireplace opening (typically this measures 16” wide and 22” high) with a minimum 125mm fireplace depth and 20mm extra for collection of debris. Our Home Survey & Installation service option is available to help you receive advice on a suitable fire or fireplace for your home and installation quotation. 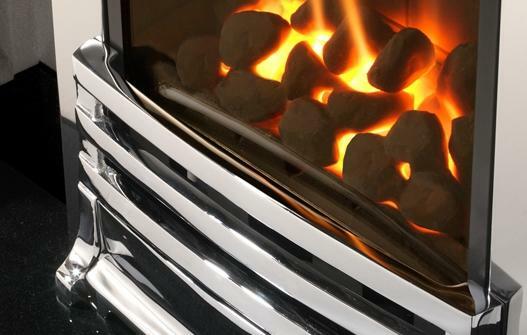 For more information on buying the right glass fronted high efficiency gas fire for your home, check out our Gas Fires Buying Guide to assist in your decision. Transform your house into a home: Talk to one of our experts on 01202 588632 or take a trip to our Fireplace Showroom in Dorset.